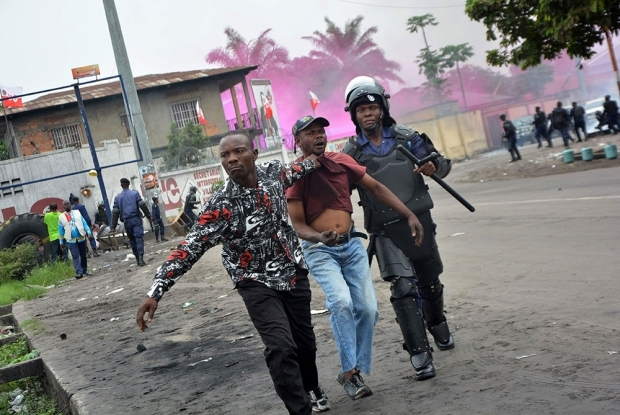 A demonstrator is arrested following clashes with police in Kinshasa last month. Police in the Democratic Republic of Congo's capital city used tear gas to disperse more than 300 people protesting against a new electoral law before parliament. Anti-government protestors filled the streets of the Democratic Republic of the Congo capital Kinshasa on January 19 and 20 to protest against a new election law making its way through the National Assembly. The new law calls for a national census before another presidential election is held which could lead to an unconstitutional extension in office by incumbent president Joseph Kabila. Rioters turned their anger against Chinese merchants in the capital, razing stores and attacking migrants. At least three Chinese migrants were injured and 180 were ushered to safety by the Chinese embassy. It is not clear exactly why the protestors focused their anger on the Chinese community in particular. Leading Sino-Congolese scholar Johanna Malm joins Eric and Cobus to discuss what may have prompted this xenophobic outburst.